Gainey values bounce back . . . Following the great depression of the 1930’s, US home prices began a steady and relentless rise, gaining an average of 4 to 5 percent per year all the way up to 2008. As we all know, that’s when home appreciation hit a bump in the road. We all lived through that agonizing real estate crash of 2008-2011 with foreclosures and short sales everywhere. If you want a refresher on just what really happened, go see the movie The Big Short (or read the book). Then again, maybe you don’t want to be reminded of the details! But the good news is that real estate values seem to have steadied out again. 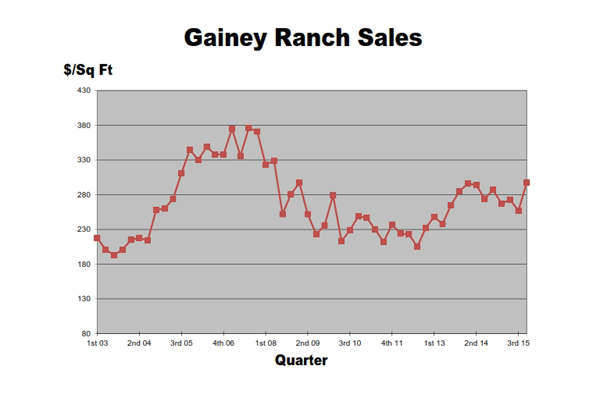 And in fact, check out the chart above that shows the real estate values in Gainey Ranch starting at the end of 2003 up through the end of 2015. Here’s the interesting thing about these values . . . if you had purchased the average property in Gainey Ranch at the end of 2003 and then sold that average property at the end of 2015, you would have achieved an average price increase of 4% over those 12 years. And that’s taking the crash of 2008-2011 into account! In other words, real estate values seem to have settled right back to their historical appreciation range of 4-5% per year! Not bad. As an interesting aside, the Dow Jones Industrial average over that same period rose an average of about 8.5% . . . roughly double real estate values. But if you need a roof over your head, an investment in Gainey Ranch real estate has done pretty well!